When Silas Rose Sr. settled in Clinton County in 1836, “few trails had been made and there were long distances between the clearings where a small field of grain would give proof of the enterprise of some hardy pioneer settler,” according to family history. “Howling wolves could be heard about his cabin at night” in what is now Bath Township north of Lansing. No longer are wolf howls heard there. Gray wolves have been found only rarely in the past 15 years in the Lower Peninsula north of highway M-55, which runs east-west between Manistee on Lake Michigan and Tawas City on Lake Huron, according to the Department of Natural Resources (DNR). And none has recently been detected south of that highway. Central Michigan University biologist Thomas Gehring said wolves disappeared from the northern Lower Peninsula in the early 20th century, victims of habitat loss and government-sponsored extermination program that paid a bounty to hunters. Gehring is the co-author of a new study saying that as the Upper Peninsula reaches its carrying capacity for wolves, chances grow that some will migrate south across the frozen Straits of Mackinac. But that doesn’t mean folks will soon see wolves in Wolverine, wolves in Walloon Lake, wolves in Wexford County, wolves in Waters, wolves in Williamsburg or wolves in Wequetonsing, experts say. The DNR estimated at least 662 wolves lived in 139 packs across the U.P. last winter. A department survey earlier this year reported 97 possible wolves reported by the public in the northern Lower Peninsula. Most turned out to be coyote or dog tracks or were otherwise unverifiable, said DNR wildlife biologist Jennifer Kleitch. However, two of those reports from Montmorency and Kalkaska counties could potentially be wolves, so “we’re monitoring those areas” to see if there is evidence of wolves, she said. 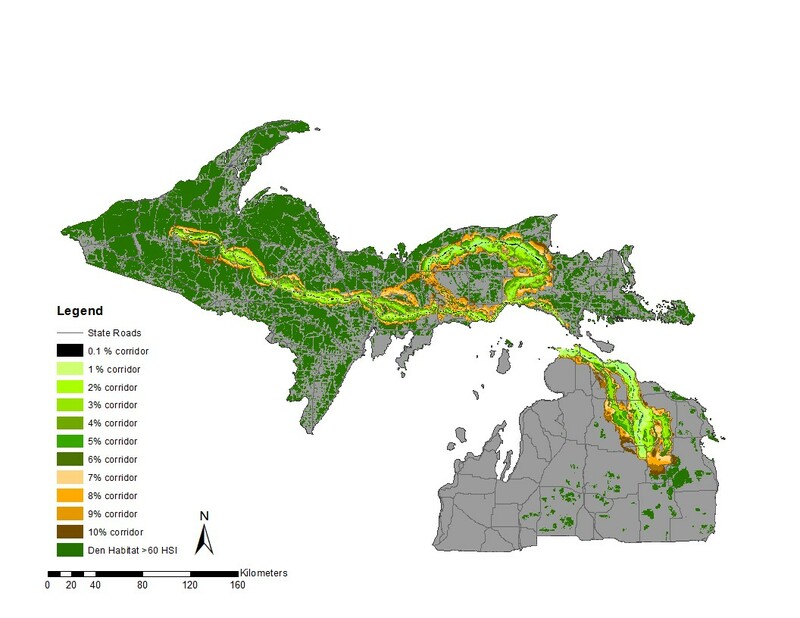 Computer modeling by researchers from Central Michigan and Mississippi State universities and the U.S. Forest Service assessed potential den habitats and “dispersal corridors” in the state. Their study calls wolves “highly mobile habitat generalists” and maps several potential routes for them to cross from the U.P into the Lower Peninsula, including ones that end in Wilderness State Park in Emmet County and Cheboygan State Park in Cheboygan County. They’d probably come from the U.P.’s 895,000-acre Hiawatha National Forest. A western route could use St. Helena Island as a stepping stone, while an eastern route could cut across Mackinac, Round and Bois Blanc islands. 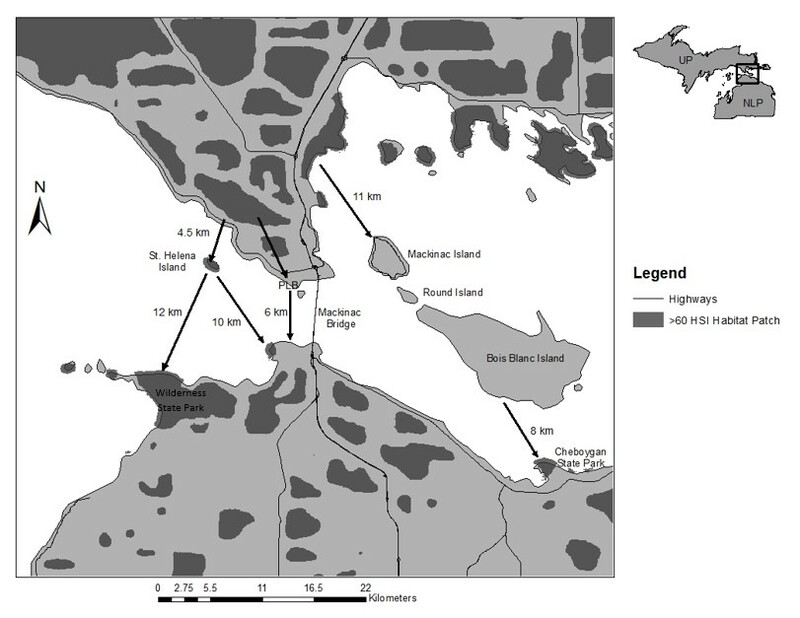 All potential routes identified in the study are shorter than ice bridges wolves have crossed between Isle Royale in Lake Superior and the nearest points on the mainland in Minnesota and Ontario. The study said the northern Lower Peninsula has enough suitable land to accommodate 50 to 100 wolves, including large swaths of public land and privately owned club properties that create a “contiguous tract of near-roadless forest.” The “largest contiguous habitat block” is in Alcona, Montmorency and Oscoda counties, where public land in the Huron-Manistee National Forest and Pigeon River Country State Forest surrounds extensive private hunting land. However, DNR wildlife research specialist Dean Beyer said the amount of suitable habitat in the northern Lower Peninsula may be insufficient and too patchy to support wolf populations. That suggests that the probability wolves will establish themselves and stay there is “not as great” as in the U.P., Beyer said. The northern Lower Peninsula hasn’t had an established wolf population for almost 100 years, according to the study. However, a radio-collared wolf from the U.P. was accidentally trapped and killed in 2004 in Presque Ile County, and a trail camera detected a wolf on the Little Traverse Bay Band of Odawa Indians reservation in Emmet County in 2015. Both were relatively close to the Straits of Mackinac. 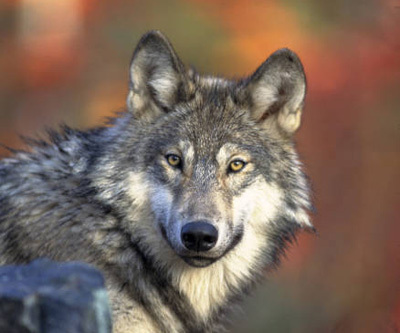 The gray wolf has been on and off the agency’s list of endangered species in Michigan. Most recently in 2014, a federal judge ordered it returned to the list, although the Trump administration has proposed delisting it in most of the U.S. The Endangered Species Coalition, an environmental group opposed to delisting, says, “Wolves need these protections to recover in areas where they have yet to appear or are just getting a foothold. “While wolves have rebounded from near-total extinction in parts of the Northern Rockies and Western Great Lakes regions, much of the suitable habitat remains unoccupied by wolves. The recovery in areas where they do currently exist was only possible because of the protections provided by the Endangered Species Act,” the coalition says. Isle Royale wolf rescue faces genetic challenge, researchers say.